David was born on 19 Aug 1893 in Pottawatomie County, Kansas. He attended grade school at Arispie. At that time, country schools held class seven months and city schools held class eight months. All country grade schools were required to have nine grades in order to qualify their students for high school. David attended nine years at Arispie and four years at Onaga, graduating in the spring of 1913. 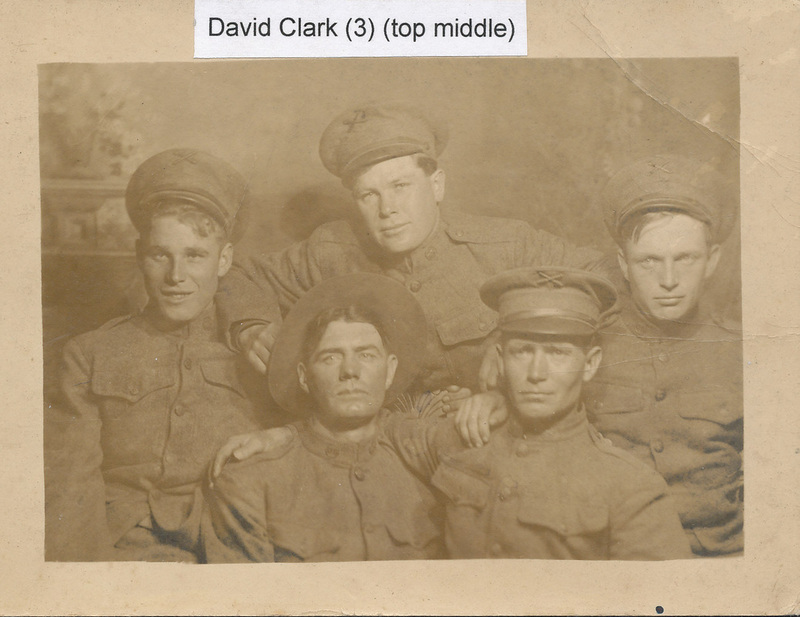 He worked in the Louie Berges Drug Store from 1913 through 1914, and on his brother John's farm until he joined the Army on May 4, 1917. He served in the first anti-aircraft battalion near Paris, France. He was discharged in March, 1918, and returned to work on his father's farm. "The community was shocked early Saturday evening by the sudden death of Mrs. David Clark, at her home in Onaga. She had not been in the best of health for the past year, but her condition was in no way considered serious. The bereaved family have the sympathy of everyone. Margaret Alice Nightingale was born September 29, 1901, near Centralia, Kansas, the second daughter of Ed and Oral Nightingale. She attended grade school near Centralia and at the Canfield school near Wheaton. She graduated from the Onaga High School in 1919. She taught the Arispie School for three terms. On August 3, 1922 she was married to David Clark. They settled in the Arispie neighborhood where they reared their six children. She was a leader in the Arispie 4-H club for a number of years and also took an active part in the Home Demonstration Unit. She was a member of the First Congregational Church in Onaga where she belonged to the Ladies Aid, and attended and taught the Adult Bible Class. She was active as a deaconess. Two years ago Mr. and Mrs. Clark retired to a beautiful home in Onaga, which she enjoyed so much. She loved her garden and her flowers. On June 17, 1950, she was called to her eternal rest and reached the age of 48 years, 8 months and 18 days. She is survived by her husband; four sons, Delbert of Cooperstown, North Dakota, Lawrence of Wamego, and Edward and Ross of the home; also two daughters, Mrs. Betty Penny of Ames Iowa and Mrs. Loral Kauffman in Indianaola, Nee; her mother, Mrs. Oral Nightingale; two sisters, Mrs. Hazel Rollenhagen of Westmoreland and Mrs. Mary Schwartz of Onaga; two brothers, Ben Nightingale of Clay Center and Albert Nightingale of Lebanon, OR. She is also survived by four grandchildren, and a host of other relatives and friends. Funeral services were conducted on Tuesday afternoon at the First Congregational Church by the Rev. Heinz Schwarz. Burial was in the Onaga Cemetery. Out-of-town relatives here for the funeral service were: Dr. Delbert Clark of Cooperstown, ND; Lawrence Clark, Wamego; Mr. and Mrs. Lowell Penny and children, Ames, IA; Mr. and Mrs. Kenneth Kauffman, Indaianla, NE; Mrs. Oral Nighingale, Downs KS; Mr. and Mrs. Ben Nighingale and children, Clay Center; Mr. and Mrs. Walter Rollenhagen and children, Mr. and Mrs. Roy Cornelius, Mr. and Mrs. Chas. Evans, Mr. and Mrs. Clinton Rollenhagen, of Westmoreland; Mr. and Mrs. August Boller, Cawker City; Mr. and Mrs. Ralph Nicholson, Glen Elder; Mrs. Maude Nightingale, Mr. and Mrs. Arthur Nightingale, Elmer Nightingale, Fred Nightingale, of Centralia; Clinton Nightingale, Mr. and Mrs. Byron Nightingale of Corning; Mr. and Mrs. Duane Lewis and girls, Mr. and Mrs. Will Clark and Arlene, Mr. and Mrs. Carl Canfield, Mr. and Mrs. Aaron Clark and girls, Miss Barbara Clark, Mr. and Mrs. David Clark, William and Lynn Clark, of Topeka; Mrs. Mabel Clark, Mrs. Jean Clark, of Kansas City , MO; Marvin Clark, Paola; Mr. and Mrs. Alvah Flinn and Family, Laclede; Mr. and Mrs. R. J. Cornelius, Percy Mack, Jennie and Coleen and family, Mr. and Mrs. William Dial, of Manhattan; Mr. and Mrs. Robert Neely of Columbus." In 1952, David married Alice Vautravers Bonjour, a widow with two children. Alice was born in 1894 in Neuchatel, Kansas. At the age of 65, on 27 Dec 1959, Alice passed away from cancer. The Onaga Newspaper published the following obituary. "LAST RITES TUESDAY FOR MRS. ALICE CLARK – Funeral services for Mrs. Alice Clark were held Tuesday afternoon at two o’clock at the Congregational Church, conducted by the Rev. Millard Marshall. Burial was in the Onaga Cemetery. Mrs. Clark, who was 65 years of age, passed away Sunday morning, December 27, at Community Hospital in Onaga, the victim of cancer. She attended the Neuchatel School, in which community she was born, and the Onaga schools. After attending Teacher’s Institute at Seneca, she taught for two years in the same school where she began her education. She was a member of the First Congregational Church in Onaga and served as treasurer and as a member of the finance committee of that church. She was also a member of the Ladies Aid. Mrs. Clark was a charter member of the Onaga Home Demonstration Unit and the American Legion Auxiliary, and was very active in community health campaigns such as the Tuberculosis, Red Cross and Cancer drives. It was her request that friends, instead of sending flowers for her memorial service donate the funds to the cancer drive. In 1914 she was married to Armand Bonjour, who preceded her in death in 1947. In 1952 she was married to David Clark, who survives her. Other survivors include a son, Everett Bonjour, and a daughter, Mrs. Sylvia Hartwich, both of Onaga; her mother, Mrs. Laura Vautravers; a brother, Walter Vautravers; her step-children Delbert Clark, Cooperstown, North Dakota, Mrs. Betty Penny, Ames, Iowa, Lawrence Clark, Onaga, Mrs. Loral Kauffman, McDook, Nebraska, Edward Clark, Albany, Georgia, and Ross Clark, Onaga; eight grandchildren and twelve step-grandchildren." 7.1 - Delbert Dean Clark was born on 24 Aug 1923 in Wheaton, KS. Delbert was a 1st Lieutenant in the US Army. On 19 Jun 1949 in Cooperstown, ND he married Marilyn Beverly Hanson (born 16 Mar 1929 in Dazey, ND). Together they had four children. At the age of 77, Delbert passed away on 13 Jul 2001 in Fargo, ND and is buried in Cooperstown Cemetery, Cooperstown, ND. 7.1.1 - Jonathan Wayne Clark was born on 5 Aug 1950 in Northwood Rural, North Dakota. At the age of 63, Jonathan passed away on 22 May 2014 in Veterans Administration Hospital, ND. 7.1.2 - Mary Beth Clark was born on 2 Apr 1953 in Cooperstown, ND. 7.1.4 - Timothy Dean Clark was born on 5 Apr 1961 in Cooperstown, ND. On 3 Jul 1980 he married Kathryn Lynn Moran (Born 16 Nov 1962) in Cooperstown. 7.2 - Betty Margaret Clark was born on 6 Sep 1924 in Wheaton, Kansas. On 3 Jun 1945 in Manhattan, KS, she married Lowel Hubert Penny (born 3 Nov 1921 in Effingham, KS). Together they had three children. 7.2.3 - Marilyn Kay Penny was born on 15 Apr 1949 in Hays, KS On 17 Aug 1968 in Ames, IA, she married Michael James Rader (born 17 Dec 1948 in Grand Island, NE). Together they have two children. 7.3 - Lawrence Edward Clark was born on 14 Feb 1926 in Wheaton, KS. On 5 Sep 1948 in Wamego, KS, he married Vera Beth Yonning (born 4 Jul 1928 in Westmoreland, KS) together they had three children. At age 84, Lawrence passed away on 26 Apr 2010 in Onaga, KS, and is buried in the Onaga Cemetery. 7.3.2 William Dee Clark was born on 8 March 1953 in Westmoreland, KS. on 23 Sep 1972 in Westmoreland, KS, he married Donna Sue Frank (born 29 Jan 1953 in Westmoreland, KS). Together they have two children. They divorced on 9 Jan 1980. Following is his obituary from the Onaga Newspaper dated 16 Aug 1981. "William Dee (Bill) Clark, 28, Wheaton, died early Sunday morning following a pick-up accident. It was reported that the vehicle rolled off the highway and down an embankment about a mile and a half south of Corning on Highway 63. Mr. Clark was first taken to Nemaha Valley Community Hospital, Seneca, and later transferred to St. Francis Hospital, Topeka where he was pronounced dead. Mr. Clark was born March 8, 1953 at Westmoreland and lived all of his life in the Wheaton and Onaga communities. He attended elementary and high school in Onaga. He was a farmer and stockman and worked at the Onaga livestock Sale Co. for several years. Survivors include a son, Russell Clark and a daughter, Renee Clark, both of Westmoreland; his parents, Mr. and Mrs. Lawrence Clark, Wheaton; two sisters, Mrs. Nancy Valburg, Onaga and Mrs. Judy Perry, Beaverton, OR; and his grandparents, David and Carrie Clark, Onaga, and Louis and Agnes Yonning, Westmoreland. Services were at 10 a.m. Wednesday at the Congregational Church in Onaga. Burial was at Onaga Cemetery." 7.3.2.2 Renee Clark married a Hoelzel. 7.3.3 Nancy Lea Clark was born on 4 Oct 1954 in Smithville, MO. On 15 Nov 1975 in Duluth, Kansas she married Charles Lloyd Valburg (born 15 May 1954 in Seneca Kansas. Together they have one child. NOI The Valburgs currently live in Onaga and still own and farm 1/2 of the original Clark farm. 7.4 Loral Mae Clark was born on 6 Feb 1928 in Wheaton, Kansas. On 21 Nov 1948 in Topeka, KS she married Kenneth Oliver Kauffman (born 24 Aug 1924 in Almena, KS). Loral is an RN and Kenneth is a Civil Engineer. Kenneth worked 30 years with the Bureau of Reclamation, Department of Interior, performing planning work on dams, irrigation canals and municipal water supplies. He also wrote a major water resource study for the government on the 11 western states. Together they have three children. 57.4.1 Mark Douglas Kaufman was born 19 Nov 1950 in McCook Nebraska. On 15 Aug 1971 in Scottsbluff, NE he married Patricia Ann Emmons (born 7 May 1950 in Scottsbluff, NE). Mark graduated from the Univ of Nebraska in Education. He is the head of the educational department of the women's prison in Cannon City, CO. Patricia graduated from the University of Nebraska in interior design. She combines her career with being a housewife and mother. Together they had two children. 7.4.2 Daniel David Kauffman was born 28 June 1953 in McCook, NE. On 9 Jan 1982 he married Britt Vivian Christensen (born 20 Jan 1957) Daniel graduated from the University of Colorado in Chemical Engineering and is on the professional staff of Chevron in Richmond, CA. Britt is attending the School of Pharmacy in San Francisco, CA. 7.4.3 Peggy Ann Kauffman was born 9 March 1956 in McCook, NE. Peggy graduated from the University of Colorado in business and accounting. She is an auditor for the United Bank of Colorado. 7.5 - Edward William Clark was born 8 July 1931 in Topeka, KS. On Nov 8, 1962 in Tokyo, Japan, he married Teruko Takahashi (born 10 Nov 1932 in Hakodate, Japan). Together they have three children. 7.5.1 - Terry Sue Clark was born on 5 Aug 1965 in Enid, Oklahoma. Dr Terry Clark grew up in Dallas. She received her Bachelor's of Science degree in Biomedical Science and her veterinary degree from Texas A&M University in 1991. After graduation she was selected for a one-year clinical internship in California with the Ventura Medical and Surgical Group. She then went on to practice in Albuquerque, New Mexico and after 3 years returned home to the Dallas area. She has been working at VCA Metroplex Veterinary Center since 1995. Currently, Dr. Clark serves as the medical director for the hospital. She is also co-author of the book Medical, Genetic, and Behavioral Aspects of Purebred Cats. Dr Clark is married and has one son, Aidan. 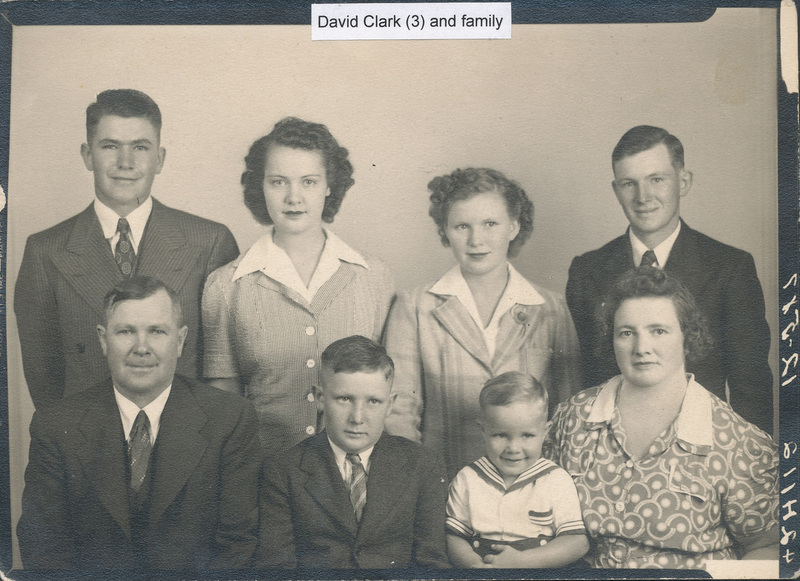 7.6 - Ross David Clark was born 20 Jul 1939 in Pottawatomie County, KS. On 10 Jun 1965 in Mesa, AZ he married Priscilla Lynn Cribbs (born 7 Oct 1940 in Stenett Hollow, AL - daughter of Opal Cribbs and Kate Dunnivant) They divorced on 7 Mar 1978 in Tulsa, OK. Together they had one child. Ross graduated from the College of Veterinary Medicine at Kansas State University in 1963. In his senior year he was selected as student representative to the Annual Convention of the American Veterinary Association in Miami, Florida. Ross practiced veterinary medicine for one year in Chicago and two years in Phoenix. In June of 1966, he moved to Tulsa and founded the Woodland Animal Hospital where he currently operates in a partnership with Dr. James Murvin. Ross served as President of the Tulsa County Veterinary Association and presently he is serving as VP of the Okahoma Veterinary Medical Association and on the board of trustees of the American Veterinary Medical Association Group Insurance Trust. In 1977, Ross was a visiting professor at Oklahoma State University lecturing on Practice Manager. Ross is a contributing author of "A Compendium on Veterinary Values" and co-author of "Medical and Genetic Traits of Purebred Dogs," released in November of 1982. Ross is one of the two grandsons of Billy who has one of the wooden planes stamped with "Wm. Clark, Ayr" that Billy brought with him to America in 1870. Wilfred Clark has the other one. 7.6.1 - Brad David Clark was born in Feb 1966 in Tulsa. on 5 Dec 1981, he married Coleen Janette Attebery Cook.